PAXworks has created the ideal labyrinth for use in small spaces and special situations. The name suggests the high place where the Eagles often nest. It is also appropriate to the 'top of the mountain' feeling that pilgrims often experience in the center of the labyrinth. 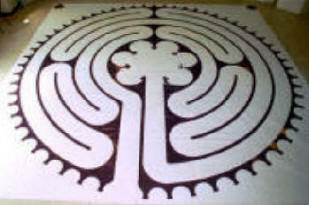 The design retains several notable features found in the Chartres Labyrinth. The Eagles Crest design has been presented successfully at church picnics, seminars, college campus', healthcare settings and retreats. 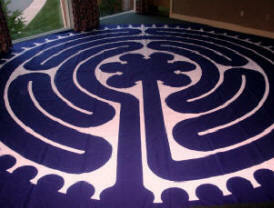 It is especially useful in smaller space settings when the longer walk of a larger sized labyrinth isn't possible. In our years of facilitating full size Chartres labyrinth walks, walkers often mentioned one or more of these features as important to their personal labyrinth experience. The Eagles Crest©Labyrinth is ideal in the size of 18 feet. It can be created in quality 12-oz Canvas or Durable wear-resistant fabric in your choice of line colors. Several walkers have joyfully agreed: " It has the Heart of the Chartres!" 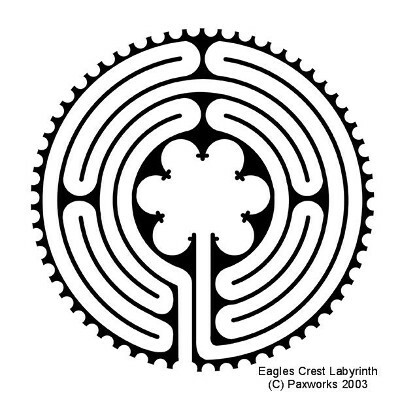 The Eagles Crest©Labyrinth for small spaces and special situations.